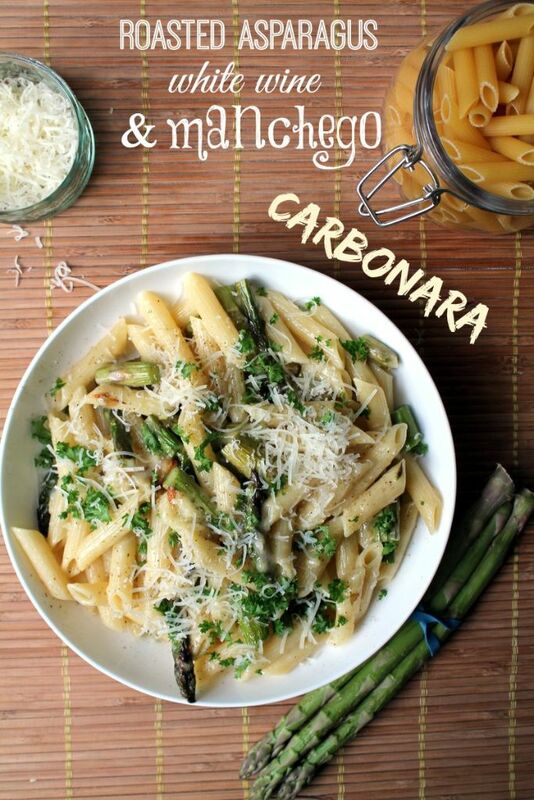 Meet my new friend, the asparagus manchego carbonara. With penne. Because it’s Mr. Veggie’s favorite. This pasta looks simple, but it really packs a punch. 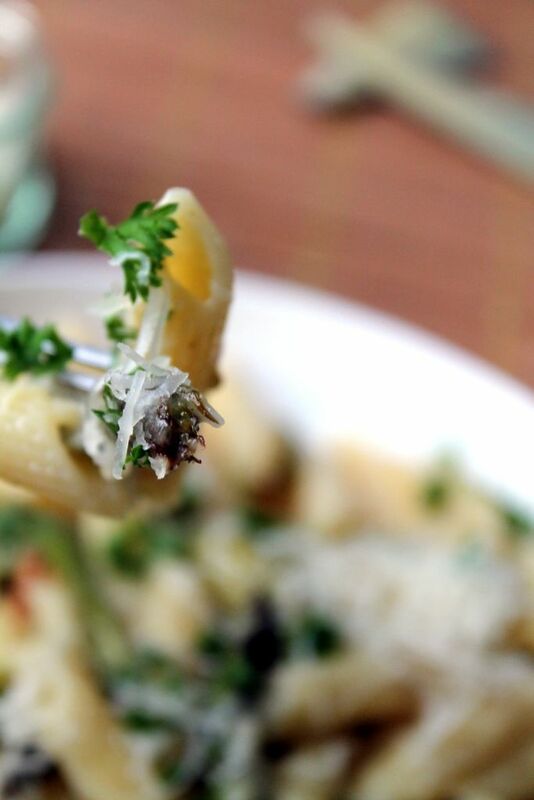 Each of those perfectly al dente penne bites are coated in egg, olive oil, white wine reduction and grated manchego cheese. Every single bite. But wait! (excuse my aggressive “fork coming right at you” shot.) It gets even better. Right at the end of that forkful, you may notice something small and dark. That, my friend, is a bit of caramelized garlic. Yep. You’re going to roast a whole load of garlic in there with the asparagus. It will add a ton of flavor but, also, some bites are going to go all brown and sweet and crunchy and caramelized, and you’re going to love it when they show up on your fork. 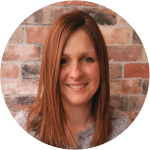 Let’s talk about manchego cheese. 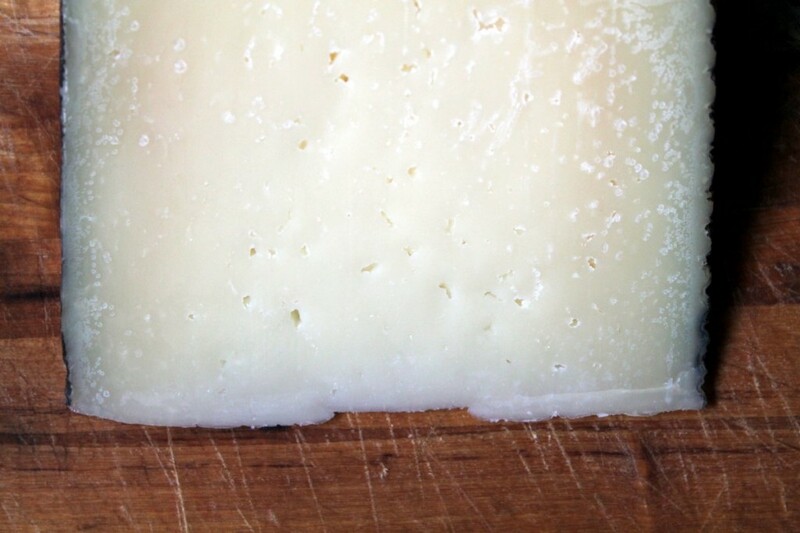 I love this Spanish sheep’s milk cheese, which has a nutty taste and a fabulous texture. It’s pretty easy to find in the UK, I use Waitrose own brand. But if you live far away and the import prices are extortionate, you might want to use fresh parmesan, romano or asiago? Oh and guess what? 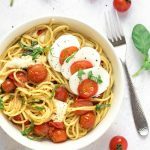 This pasta is really quick to throw together too. I wasn’t even trying to make it easy. Reducing wine? Why not! It’s a Saturday! But if you plan it just so, you can get it on the table in half an hour, no problem. It’s just a bit of a juggling act. 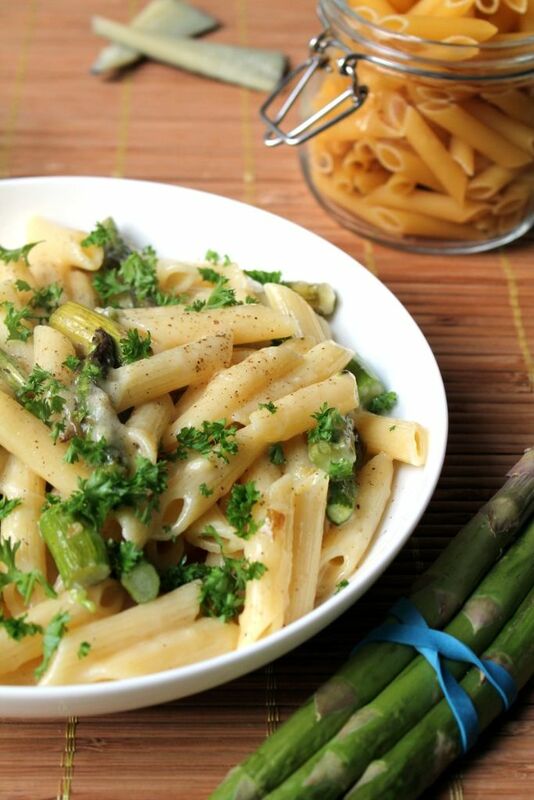 Conveniently, roasting an asparagus takes just a little more time than boiling penne, which takes just a little more time than reducing wine. 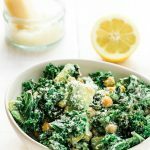 So, while you need to act quickly and confidently, it can be ready much quicker than you’d think. 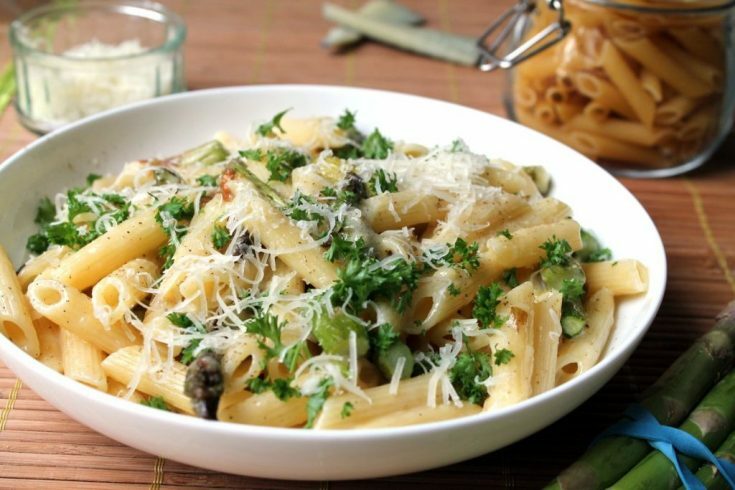 A vegetarian pasta carbonara recipe that really packs in the flavor. 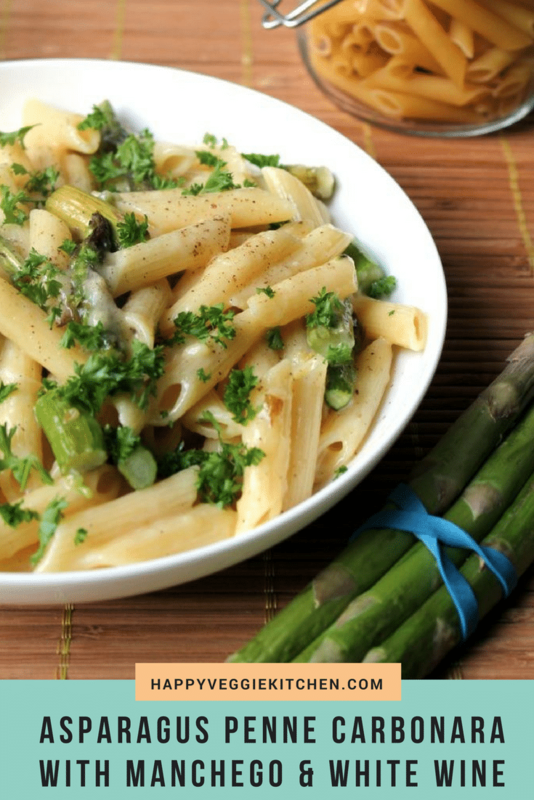 The with manchego cheese and white wine sauce is creamy and decadent, and beautifully coats the roasted asparagus and garlic. 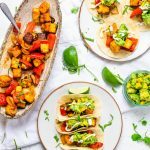 With so much good stuff packed in every bite, no one will mind that it's meatless! 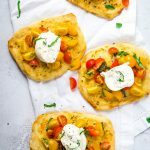 It comes together in half an hour for an easy veggie pasta dinner. 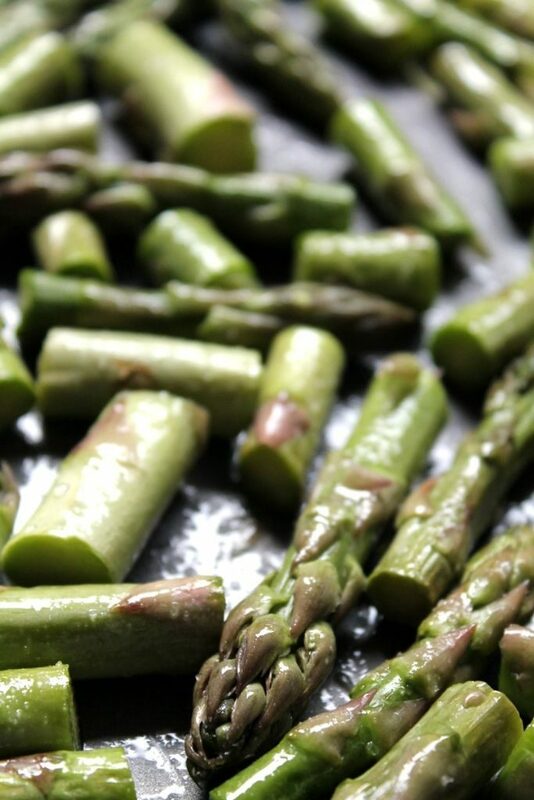 Toss the asparagus in a little olive oil, put it on a baking tray and sprinkle some salt over it. Add to the top shelf of the oven once it's at the desired heat. As soon as it's in, get your penne cooking in a saucepan of boiling water. As soon as the pasta is simmering, start the wine reduction. Add the wine to your smallest saucepan, bring to a boil and then simmer uncovered over a low heat. Keep a close eye on it. You want the liquid to reduce, but not boil all the way down. Once there's about 2 Tblsps of liquid, take it off the heat. If you've done all this in quick succession, all three elements will be ready at roughly the same time- about 10 minutes from now! 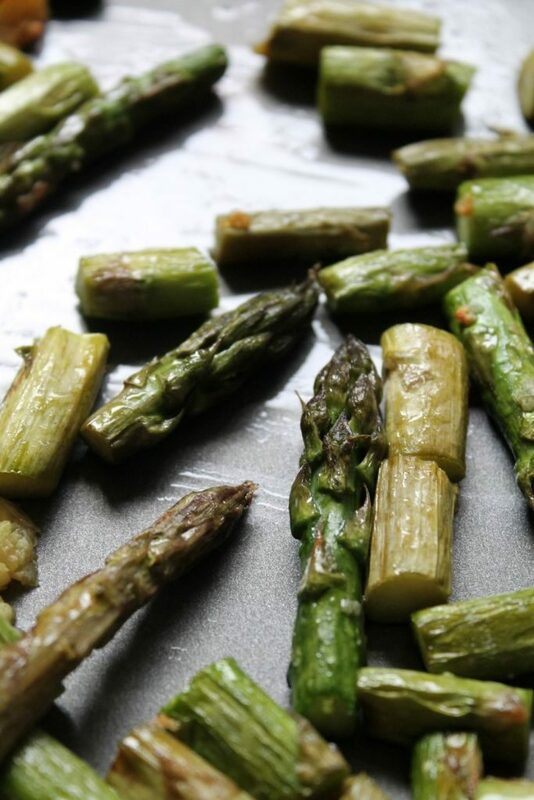 After 5 minutes, add the garlic to the asparagus and put it back in the oven until it starts to crisp. In a large bowl, crack the eggs and whisk together with the extra virgin olive oil. Once the pasta is cooked, drain and add to the bowl with the egg mixture. Stir it constantly, don't let it sit, or the egg may start to cook and harden. Add the wine and cheese, stir through as the cheese melts. Finally, add the roasted asparagus and mix through. 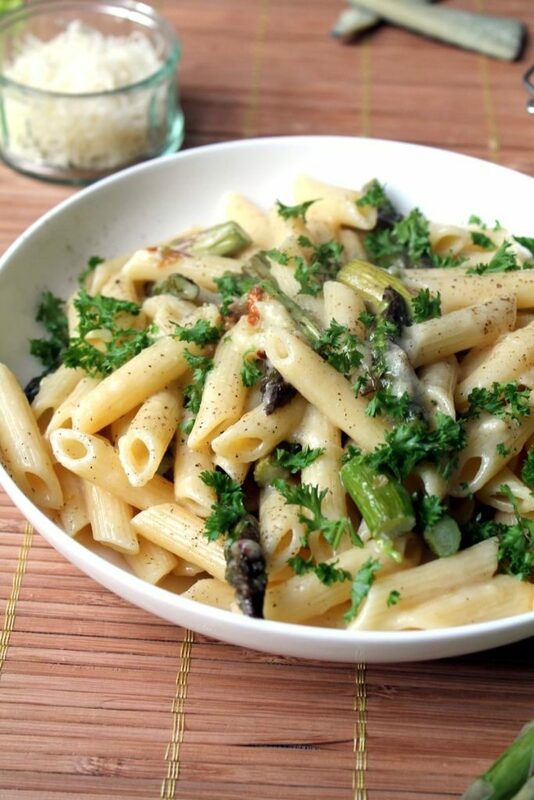 Serve in large bowls, topped with parsley, ground pepper and a little extra cheese. This sound delicious! Do you chop the garlic? Whole cloves seem a bit large for this recipe. Oh yikes, good catch! I sliced the garlic so that there were still distinct crispy garlic bits. I will edit the recipe as soon as I next to get to a computer! Hello – this looks delish, but are we really going to eat raw eggs? The egg heats and cooks a little when the hot pasta goes in, but yeah it’s not cooked enough to harden. It’s what gives carbonara that rich slippery texture but you could leave it out and add a little butter instead. I’m always looking for recipes to cook for my vegetarian daughter. This was easy and delicious! I chopped the asparagus into 1″ pieces and chopped (not minced) the garlic cloves. I really don’t think there is any concern about the eggs not being cooked. 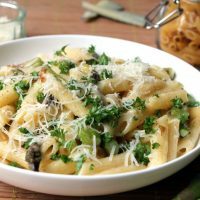 If you stir while adding the hot pasta right after draining it, then add the hot wine, and then the hot asparagus, I’m sure that in the process of coating all those hot ingredients, the egg gets cooked. It just doesn’t look like cooked egg because it is blended with olive oil and coating the pasta. It made a wonderful creamy sauce! Thank you for sharing!